Inurnment marker for Ellis S. Cook in the Mount Hebron Baptist Church (Burke county), North Carolina. Ellis enlisted at Camp Croft, SC on 25 September 1942. Pvt Cook was assigned to Company B, 508th at Camp Blanding , FL where he completed the rigorous basic training followed by jump school st Ft Benning, GA. In May 1943 found himself in home territory as the regiment conducted field maneuvers in the Camp Croft area. 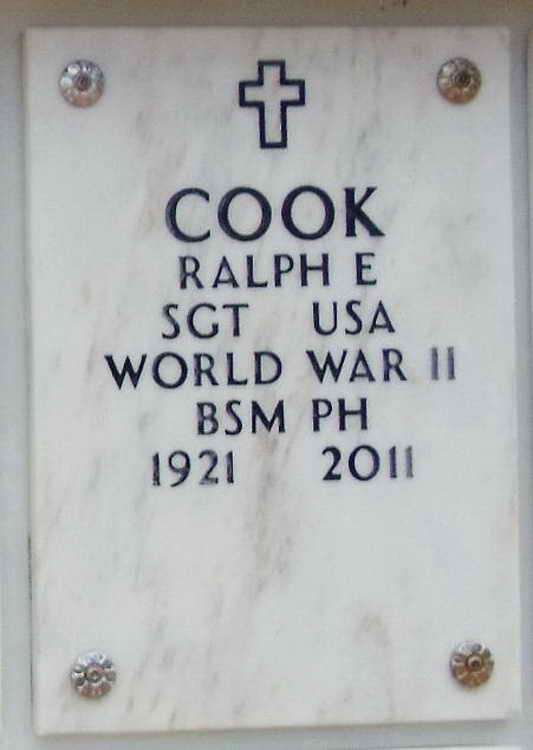 A member of Company B, Pvt Cook jumped intro Normandy on D-Day, June 6, 1944 and was reported Missing In Action on 26 June 1944. His name was included on an unofficial list compiled by Sgt Jim Smith of Company B officers and men who jumped into Normandy. Pvt Cook had in fact been captured on D-Day and remained a POW for the next eleven months. He was ultimately released from Stalag 4F. He was awarded the Bronze Service Arrowhead for his participation in Normandy assault as well as the Prisoner of War medal.